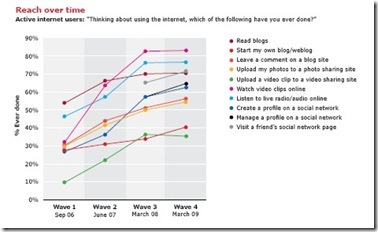 It’s time for my social media monthly round up for August 2009! It has been another month of hectic activity in the social media world. In the wake of research findings from Forrester and Universal McCann it is restated that the social media segment is the favourite activity for online users. Forrester Research Findings says that social networking proves a stellar growth category, with the use of social media sites jumping from less than 15% in 2007 to above 30% in 2009. 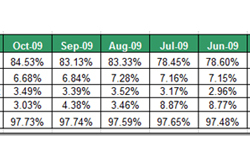 With 68% network users Facebook comes as the most popular destination, ahead of MySpace at 59%. Uploading for video sharing sites records a steep fall as users tend to upload and share this within a social media these days. 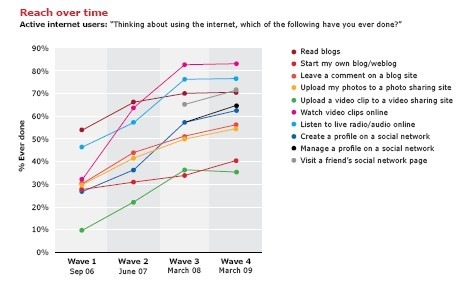 Universal McCann has also come up with similar statistics that show the pervasive influence of social media. Two-thirds of active internet users have managed a social media profile and 71.1% have visited a friend’s social network page. The figure is e ven more high when we look at active social media participants instead of just active internet users, which is 96% taking the average across 38 different countries. The U.S. has emerged as the frontline player in the social media space with 60% internet users managing a social media profile against last year’s 43.2%. While the number of people who use social media have a continued upswing, it is interesting to note that user behaviours have also become more complex. In the ever-changing internet instead of just being places where people connect, social media are now also acting as virtual search engines and are giving greater emphasis on search as well. If search volumes on things such as Twitter Search and Facebook Search grow so to will companies search engine optimization efforts. New research has revealed that the link between internet marketing and social media such as Facebook has grown by 46 per cent in the last two years. In July 2009, we witnessed the search deal between internet giants Yahoo and Microsoft.. This was the most topic in the social media avenues this month. Facebook has led the way in innovation this month. Touted as “Twitter-Killer” Facebook’s acquisition of FriendFeed signals the next step in social media strategy powerful enough to pave the way for another search giant in the near future. The very next day after stocking FriendFeed Facebook announced the upgrade of its search tool capabilities. The new search engine, as described on Facebook’s blog allows user to search the last 30 days of their News Feed for status updates, photos, links, videos and this can be shared among friends and Facebook Pages of which they are fans. Adding to this host of innovation Facebook released their stripped down version Facebook Lite that closely resembles Twitter and promises to eat into Twitter’s user base. Here’s the round up of major social media news for this month. Twitter has redesigned their homepage giving greater weight to search, which could further heighten the use of search engine optimization of tweets. In Twitter’s blog space Twitter co-founder Biz Stone wrote that the new change is aimed at showing the power of Twitter as a tool for finding information for those who may not be familiar with the service. Yahoo! owned Flickr has also made a makeover to its search results page. Flickr blog post made it clear that these changes will make it easier to browse through the billions of photos and videos on Flickr, and to connect to the communities that help make sense of all those photos. Now, instead of scrolling through a single stream of images, you see a grid. Delicious, another Yahoo owned web property has rolled out some new additions, (though not innovative), to its homepage taking mileage out of Twitter’s growing popularity, . Now we can see a new tab ‘Fresh Bookmarks’ which will bring up the latest bookmarks from Twitter tweets. Yahoo! mentioned it as “improved search tools” in a post in Yahoo! Search Blog with advanced time tag filtering controls so that one can search within a given date range or filter the results by tag. Delicious also added an option in the ‘save bookmark’ page for sharing bookmarks with Twitter users. 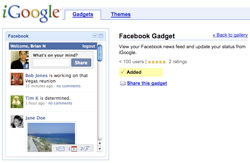 iGoogle, Google’s widget-based homepage released a host of new social gadgets and an "update" feature to its offering. Google’s CEO Eric Schmidt has resigned from his position in Apple’s Board. AOL has bought back Google’s 5% stake in its company. That’s what happened in the social media sphere this month. Facebook is on a high at the moment and we await to see what Twitter is up to next to counter some big FB advancements! It will be interesting to see what Twitter does in an attempt to keep Facebook from stealing their piece of the pie. I also wouldn’t be surprised if while Facebook and Twitter compete and continually upgrade their service offerings…that MySpace will continue to go down. For me, I’ve never seen the value in MySpace. It just doesn’t have that same sense of clean professionalism as the other big players like Facebook and Twitter. Interesting findings, majority will use search engines for search and social media for connecting friends. But a medium like Facebook has won the hearts of online users as it can act both as a real time search engine and a social networking medium. Yes, social media sites are behaving almost like search engines. FB and Twitter did a revamping on their search page by giving preference to search features. It seems that everyone has realized that search is the single most important think in the online marketing sphere!